A banana cookies recipe combines two of America’s favorites; a banana and a cookie. In many countries a cookie might be called by other names like biscuit or biscotti; quite often less sweet than our American gem. Cookies are most often the first product that beginners start with because of their popularity. By adding bananas in the recipe, they are sure to please. 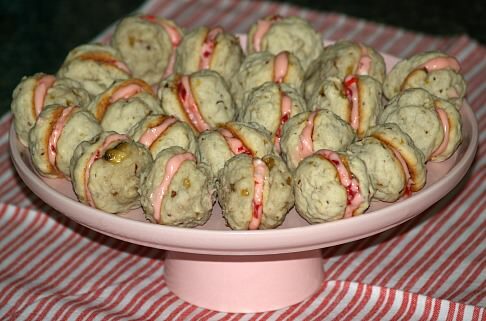 Banana cookies recipes can be made as regular cookies, as filled cookies or in the “bars”. Regular cookies could have the bananas, most likely mashed, in the actual cookie dough. Sometimes the cookies get the banana taste by adding an icing on the top with bananas in it. One of my favorites is stuffed banana cookies. You could add a great banana flavor by stuffing any two regular cookies with a banana filling. Then we have many great banana bar cookie recipes. Most of these are so moist and delicious. Try them all! Combine all ingredients in a large mixing bowl and blend well; chill dough. Measure dough with teaspoon and shape into balls; place on ungreased cookie trays and flatten with bottom of glass dipped in sugar. Bake for 10 to 12 minutes; cool. Place flat sides of two cookies together with cream cheese filling. I include this banana bar recipe as a banana cookies recipe. Combine oat bran, flour, ½ cup sugar and 1/3 cup cocoa powder. Combine banana, ¼ cup cooking oil, corn syrup, egg whites and vanilla; add to flour mixture and blend well. Pour into a lightly oiled 8 inch square pan and spread evenly. Bake about 25 minutes or until center is set; cool. Combine 2 teaspoons cocoa powder and 2 teaspoons cooking oil. Gradually stir in powder sugar and 1 teaspoon warm water adding remainder of warm water to make a thick glaze. Combine brown sugar, butter, preserves, vanilla and eggs in a large bowl and mix well. Add flour, baking powder, baking soda, bananas and nuts; blend well. Put mixture in prepared pan; bake about 30 to 40 minutes or until pick comes out clean. Cool completely, dust with sifted powder sugar and cut into bars. 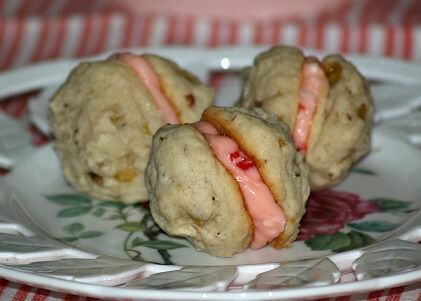 This banana cookies recipes is easy to make and always delicious! Lightly grease 9 X 13 inch baking pan. In a large mixing bowl combine all bar ingredients and mix on medium speed for 1 minute. Combine all topping ingredients and blend until crumbly; sprinkle over the batter. Bake for 20 to 30 minutes or until a pick comes out clean. Although this is more like a dessert bar recipe, I include this as a banana cookies recipe because it is cut into bars to serve and is deliciously flavored with dates and bananas. Line 9 inch square (or equivalent) casserole dish with wax paper. Set aside ½ Cup of graham cracker crumbs. Fold in remainder of graham cracker crumbs, dates, walnuts, bananas and marshmallows. Turn into prepared dish pressing slightly to even it out; top with reserved ½ cup crumbs and press in slightly. Refrigerate overnight; turn out on tray and cut into bars or squares.